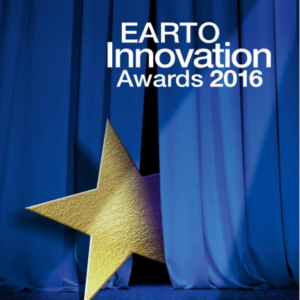 The 8th edition of the EARTO INNOVATION AWARDS CEREMONY was held on 12 October 2016, 17.30-21.00 at the prestigious BELVue Museum, next to the Royal Palace. This year again a wide range of RTOs’ work was presented through our two categories: “Impact Delivered” and “Impact Expected”. Our guest of honor this year was European Vice-President for Jobs, Growth, Investment and Competitiveness Jyrki Katainen, who delivered a keynote speech and handed the awards to the winners. 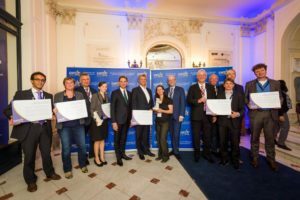 CEA (Alternative Energies and Atomic Energy Commission) received the award in the Impact Expected category for the development of the wireLEDTM technology, a new generation of 3D LEDs with drastically reduced production costs and higher performance. PCCL (Polymer Competence Center Leoben GmbH), EARTO member through UAR (Upper Austrian Research), received the award in the Impact Delivered category for the development of the Syntegra UV technology, an innovative production process which enabled the commercialisation of the first low-allergenic glove. You can find more about those innovations and other finalists in the 2016 Innovation Awards brochure.